This year it's some blooms from around the garden. I love the red Tulips and the pink blossom. A green vintage doily found out on jolly jaunt around Bristol this week where I almost walked my poor little feet off..... some painted wooden eggs, a little wooden bunny and the little brooch made from this months Mollie Makes free gift. What do you think of the chalk paint? !......it's very white isn't it....... I did promise a little chalk paint post. But I'm not sure how much there is so much to say. This is what the table looked like before. I chose chalk paint because the original wood had a layer of varnish. Chalk paint is supposed to be able to be applied to anything, without any preparation to the surface. I think the chalk paint went on well to the table. Probably helped by the mainly smooth surface. It's quite forgiving, covering old chipped paint and damage quite easily. It's quite thick and you need to paint fast. I painted in sections, one plank at a time, and you need to finish with the brush strokes going the same way. It dries fast and does feel very chalky! To get a smooth finish I gave the table a very light sand, painted a second coat and then finished by polishing with a soft wax. The wax gives the chalk paint a sheen and makes it feel more like normal paint. You could distress the paint with more sanding at this point, but I think this will happen naturally. I don't think it's that durable, and I don't think I would be in a hurry to use it again. It's probably great for picture frames, smaller, harder to paint objects.....and definitely not for very porous, large, fiddly objects, like benches! Other things call, like a sunny moment up on the common. This was quite heavenly. I dropped down into the grass, just to take it all in. Sitting down amongst the wild flowers. It's so lovely up here. I've been carrying little dog around, but now she walks a little bit here and there. Her leg is mending. What a sweet heart. We need to come up here. It kind of puts everything into perspective. 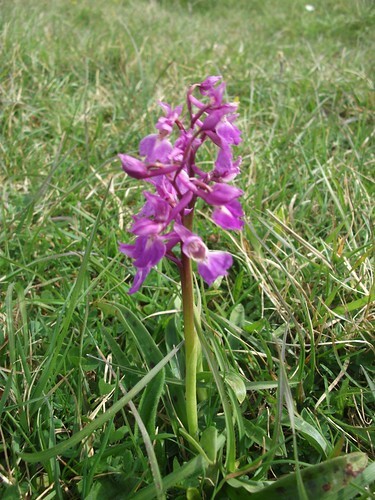 ......when everything's a bit difficult back at the ranch.....Wild orchids and Cowslips, natures bounty. Happy Easter! Love the table, the white is very intense, and will show off your displays beautifully. Your Easter tree is fab! The brooch has turned out perfectly. I am inspired to have a go at making mine, now. 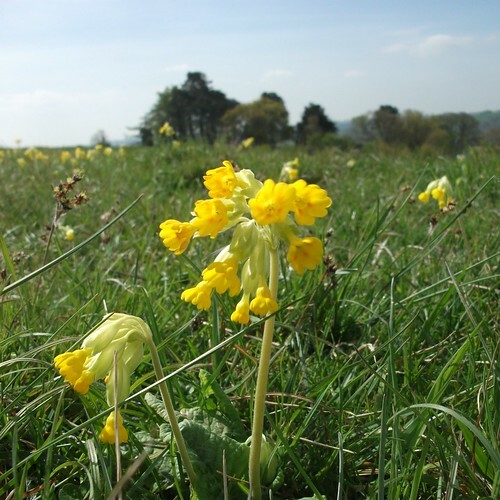 Cowslips are amazing flowers. Easter Monday already - Happy Easter Heather! Your table decorations look lovely and the table itself is great - I really like it and think you did a huge job tackling it in the first place: great result! Yap, a nice rest surrounded by nature helps a lot : it makes you feel lighter! Looks like a lovely place to walk, and smell the air ! Clears the mind, love your Easter display, like the little wooden eggs. Your table looks great Heather and I think that letting it become distressed in its own time is a good move. Thank you for your chalk painting tips - I've never tried this type of paint but have been tempted by all the talk of no sanding or prep...I do loathe the prep part. So it's good to know what it does or doesn't work so well on, thank you. Happy Easter! 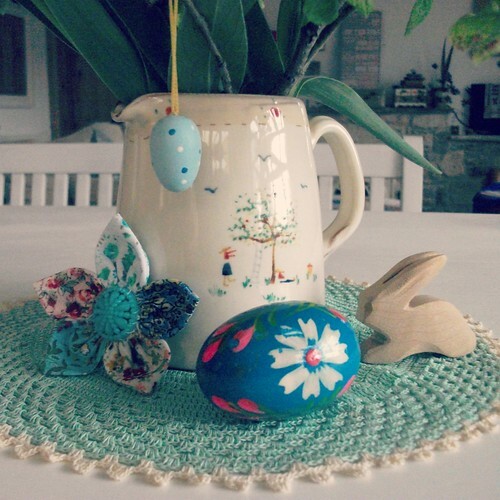 The vignette with the jug, flowers, brooch and bunny is so sweetly Easter, it's lovely! What a lovely refreshing Easter post. I agree about projects sometimes it just need a time and place! 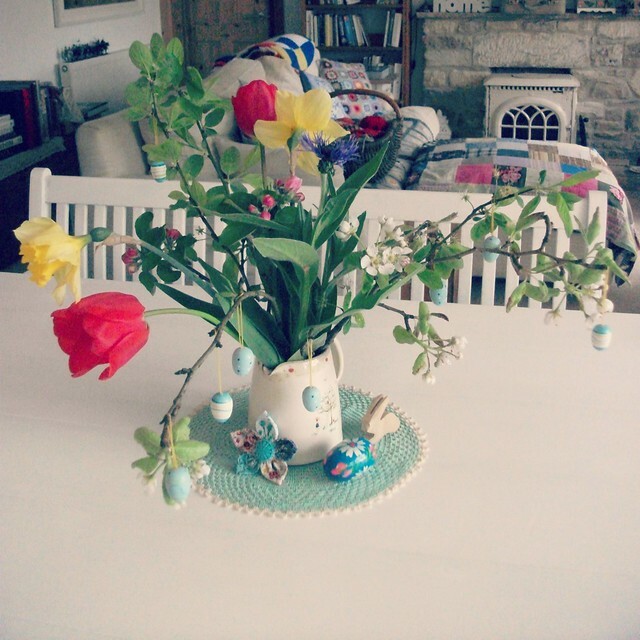 The jug with your Easter display is beautiful. Hope you had a good Easter. Your Easter display is so pretty. I haven't tried chalk paint yet but I'm intrigued! more spring days.. i second that! Hope you've been having more of those lovely days, Heather!! PS. My friend loved the heart garland! Hello! Looks like I'm your 200th follower! I'm paying you a return visit - such a pretty blog:) And thanks for the heads-up on chalk paint. I've been considering giving it a try but may not if it's not that durable (we have a 20-month-old and he likes banging things around). 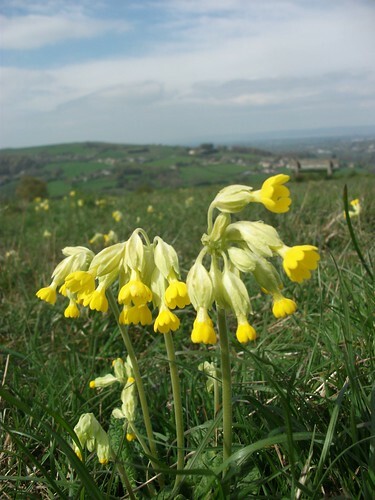 As for cowslips... I love them. One of the few yellow flowers I'd have in my garden. 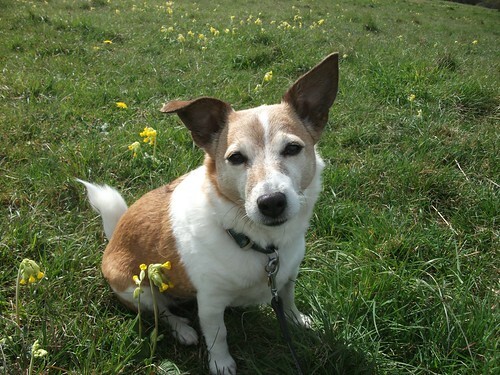 Hi Heather, I just found your blog and I look forward to reading more of it! I really like your table and the way you have decorated it. I especially love the jug you placed those pretty flowers in. May I ask who it is made by? I would so love to have one. Hi the jug is by Caroline Zoob. I notice there is a pinterest board for her, you may find a link to it there. Thank you Heather, I really appreciate it! !